Agnes is sent to wait on the farm of District Officer Jon Jonsson and his family, who are horrified and avoid Agnes. Only Toti, the young assistant reverend appointed as Agnes's spiritual guardian, is compelled to try to understand her. As the summer months fall away to winter, Agnes's story begins to emerge. And as the days to her execution draw closer, the question burns: did she or didn't she? Based on a true story, Burial Rites is a deeply moving novel about freedom and the ways we will risk everything for love. In beautiful, cut-glass prose, Hannah Kent portrays Iceland's formidable landscape, and asks: how can one woman endure when her life depends upon the stories told by others? 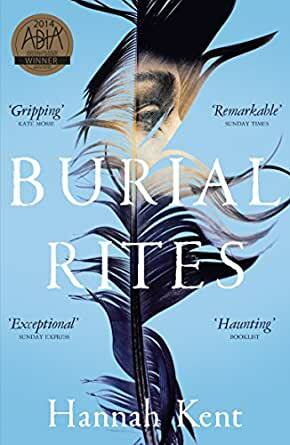 Fans of Anna Funder's All That I Am and Jessie Burton's The Miniaturist will love Burial Rites. Based on a true criminal trial the story is steeped in the grunt and grind of poverty and freezing cold weather in the 1800 in Iceland. For anyone who has experienced the weather such as this, the author has captured it fairly well, and the notion that all of the beast is used is well displayed. Liked it - glad l read it. Glad also l that l no long live in a cold country. One of my favourite books that I have read in 2016. Hannah Kent really captures the essence of the Icelandic countryside to the extent it is almost one of the characters. She also creates very real, human characters and her portrayal of Anges contemplating her death whilst revisiting her past is masterful. Agnes is neither an angel or a saint, doesn't do self-pity, even though she is in many ways a victim of the times and culture in which she lives and this makes her all the more compelling. A great story that has you asking how you may react in similar circumstances. This dark tale is engrossing. In Hannah Kent's unique style, she weaves a story of intrigue and mystery around true events - set in Iceland in the early 1800s. A young woman awaits execution, but did she commit the crime? Beautifully written and well worth the read. 5.0 out of 5 starsWhat a debut! Haunting... if I were only allowed to use one word to describe this novel, that would be it. Aspects of this book has stayed with me long after I finished reading it. The prose is quite unique (outstanding personification - even better than The Book Thief) and it's clearly a very well researched book. That said, it doesn't overwhelm one or get bogged down with unnecessarily lengthy details. The descriptions of the settings, characters and emotions/thoughts are all riveting... I didn't skim over anything. I recommend this to everyone. This is one of those rare novels that I will return to re-read in its entirety (I already re-read some of the more powerful passages and the final chapter immediately upon finishing!). 5.0 out of 5 starsAn amazing story of injustice and sympathy but witha deadly ending. This is a story of justice gone wrong; of true resilience and the bigotry, or should I say hatred of those they don't understand. The main character we are lead to believe is evil but but that slowly proves otherwise and the great sadness of this book is that it is true. It is the story of the rich being able to determine the lives of the poor and it is also the story of in one sense a corrupt church and in another a sad, young pastor who is desperate to help his parishioner but in the end is stopped the 'those who know better'. If you want to read a good book that holds you on every page then this is the one for you. I found the end rather abrupt but then in the end life is rather abrupt. I give it five stars. One of the best books my book club have read. I loved this book and cannot recommend it highly enough. Hannah Kent has used her experience as an exchange student in Iceland to return there and carry out thorough research. The story she created about Agnes vividly describes the difficult times Agnes lived in. The writing is flawless. Congratulations to Hannah Kent for delivering an excellent story. starring Jennifer Lawrence. Amazing story well told. 3.0 out of 5 starsA sad read! Burial Rites by Hannah Kent is a well written novel; obviously a very sad story about Agnes and her cruel execution in an era when the poorer citizens were not represented by good lawyers, and the witnesses bigoted by hearsay!